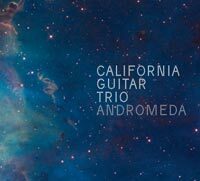 The California Guitar Trio (CGT) celebrates its twentieth anniversary with the release of Andromeda in October 2010 on Innerknot Records. As a special commemoration, the new CGT album will also be released on vinyl through Karate Body Records. 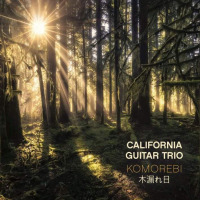 The California Guitar Trio is Paul Richards of Salt Lake City, Utah; Bert Lams of Affligem, Belgium; and Hideyo Moriya of Chiba, Japan. The trio first met in England in 1987 while studying with iconic King Crimson guitarist Robert Fripp. After touring together as part of Fripp’s League of Crafty Guitarists, the three guitarists convened in Los Angeles and founded The California Guitar Trio in 1991. The CGT plays a unique style, with guitars weaving an intricate knot work of interlocking parts to form a whole. Richards, Lams, and Moriya can create music which sounds like it is performed on a kind of “super-piano” and at other times unfolds in an ethereal, otherworldly psychedelia. In space, CGT’s music was played to wake the astronauts aboard the NASA space shuttle “Endeavor”. Here on Earth, the trio’s music has been featured extensively on NPR, NBC’s Olympics coverage, and various CBS, CNN, and ESPN TV programs. “This new CD captures a balance between the pure acoustic sound and the processed electrified sound of the CGT, something we've experimented with before, but not to this degree,” says Lams. Having played with a Who’s Who of great musicians over the years, Andromeda features guest performances by Tony Levin, Julie Slick, Eric Slick, Tom Griesgraber, and Tyler Trotter. The cover of Andromeda also serves to celebrate another 20th anniversary, that of the Hubble Telescope. The CD cover image, designed by Pablo Mandel, features a photo from the new camera on the Hubble. The CD cover has earned a prize in the European Space Agency’s Hubble Pop Culture competition. All About Jazz musician pages are maintained by musicians, publicists and trusted members like you. Interested? Tell us why you would like to improve the California Guitar Trio musician page.